Aside from a bike, there are plenty of things out there that contributes to the life of cyclist. Here’s our 6 things we just can’t live without..
Have you ever met a cyclist that isn’t into coffee? No, we haven’t either! That’s why coffee has taken the number one place on our list of things cyclists can’t live without. Coffee has many benefits from increasing mental alertness to effects on the contraction of a muscle, blood flow, improved performance as well has assisting with fat mobilisation in the diet. It’s fair to say coffee is our new best friend. That’s the sad truth of being a cyclist now a days with the social media app becoming an integral part of cycling. Strava has become hugely popular since it was first launched in 2008 and it is now a familiar term within the cycling language. Providing a wealth of tools to track cycling, set goals, measure progress and grow a following with other cyclists we really can’t imagine our lives without it now. Our rides would be a lot less comfortable without it, our favourite skin tight clothing takes the 3rd place as the item that we can’t live without. Lycra has been keeping us warm, dry and cool since cycling began and with it’s long list of benefits from making us ride faster to giving us all over body definition, we’d be lost without it. A well lubricated bike is a healthy bike and it plays a vital part in the maintenance routine of our rides. 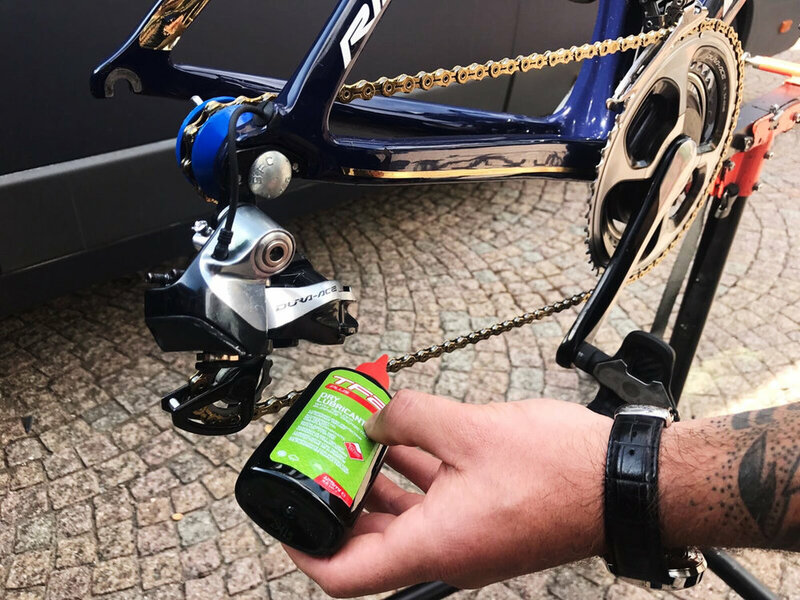 Enhancing our performance when riding, keeping our bikes running smoothly and increasing the life of our bikes are just some of the reasons why our cupboards are stocked up with it. Who would’ve thought a little bottle of lubrication could be so useful? Whether you’re a road cyclist, racer or mountain biker you’ll know that being a cyclist means experiencing all kinds of weather and if there’s one essential piece of kit every cyclist needs, it’s a waterproof jacket. Depending on the type of cycling you’re into, waterproofs are specifically made to make our wet, windy and cold rides a little easier and if you have the motivation to ride any time of the year you’ll definitely be needing one. Getting a puncture mid ride is one of the most frustrating and unpredictable downfalls to cycling. Puncture repair kits have saved us and helped us get back up and rolling again in many emergencies and unless you have money to waste on taxi’s, preparing a repair kit is the best thing you can do setting out on a ride.